One of these green energy industry companies is clearly beating the other. Check out the latest Ballard Power Systems and Plug Power earnings call transcripts. 2018 was a rough year for the two top hydrogen fuel cell companies. Shares of both Ballard Power Systems (NASDAQ:BLDP) and Plug Power (NASDAQ:PLUG) dropped more than 45% in 2018. Even in a year that was unkind to renewable energy stocks overall, those are some jaw-droppingly awful numbers. But when companies' shares take a tumble, it may be time for smart investors to go bargain shopping. Let's look at these green energy companies to see which one looks like the better buy after the big sell-off. Forklifts are one niche market in which fuel cells are competitive as a green energy option. Image source: Getty Images. In middle school, it helps to have a big friend nobody wants to mess around with. Because hydrogen fuel cells are a niche industry at this point, and both of these companies are small -- Ballard's market cap is just $431.9 million, while Plug's is an even smaller $290.5 million -- they've teamed up with some heavy hitters to try to maximize revenue, and to impress the stock market. For Plug, this approach has materialized in the form of major deals with big warehouse operators to purchase and maintain fleets of fuel cell-powered forklifts. Plug currently has deals in place with Amazon.com and Walmart, which have boosted the company's top line and its prestige. The company is also trying to break into the broader transportation market -- not to mention the public consciousness -- having provided its first fuel cell delivery truck to FedEx back in May. Ballard, on the other hand, has its big friend in China. Ballard has been going after the bus and commercial trucking industry by engaging in joint ventures with Chinese manufacturers. In 2016, it inked its first joint venture with Guangdong Nation-Synergy Hydrogen Power Technology. Another partner, Zhongshan Broad-Ocean Motor, recently exercised its option to take a 9.9% stake in Ballard. Ballard followed that up in November with another joint venture, this time with automotive equipment manufacturer Weichai Power. Through these joint ventures, Ballard hopes to roll out the next-gen fuel cell technology it's been developing. The problem with relying too much on one's partners is that if a partner can't or simply doesn't hold up its end of the deal, a company is left with few options, none of which are attractive. For Plug, although its big-name partnerships seem to be generating more revenue for the company's top line, that hasn't translated to bottom-line growth. In fact, Plug has only posted a single profitable quarter in the past 10 years, and that was all the way back in 2014. It looks as though Plug's heavyweight partners may be using their clout to demand extremely generous contract terms from Plug, which is cutting into the company's margins. If you want to get deep into the numbers on this, check out my Foolish colleague Maxx Chatsko's excellent take. Meanwhile, FedEx doesn't seem to have been blown away by its first Plug fuel cell delivery van, considering it added only 1,000 of the battery-powered electric vehicles to its fleet in November. Ballard's partnerships aren't paying off as expected, either. Even as the company announced its strategic collaboration with Weichai in its Q3 2018 earnings release, it was revising its full year 2018 revenue forecast downward to between $90 million and $95 million. "Slower-than-expected ramp-up" and "near-term headwinds" in China were both cited as causes for the company's poor performance. Although both companies have some big partnerships that might pay off down the road, the fact remains that outside a few niche markets -- forklifts and airport vehicles, primarily -- fuel cells just aren't gaining the widespread acceptance that electric batteries have already achieved. Numerous companies, including Tesla and General Motors, are already working on battery-powered passenger vehicles, tractor-trailers, delivery trucks, and even buses. For fuel cells to make inroads into these markets, they will have to become exponentially cheaper, or more efficient, or both. Although neither company is currently profitable, revenue at Plug (the blue line) has been increasing this year while Ballard's has not. 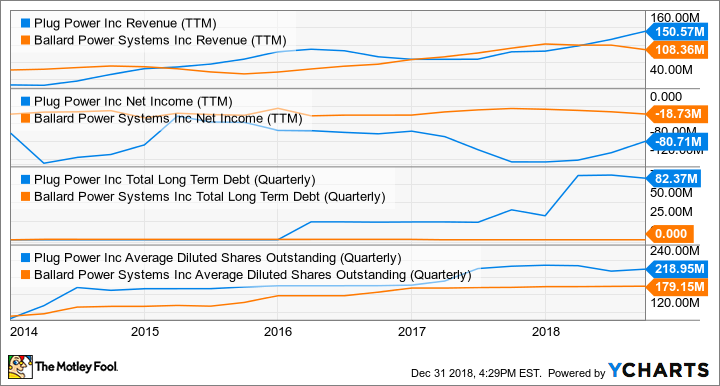 But in spite of that, Ballard (the orange line) is less unprofitable than Plug, has no debt, and hasn't been diluting its share count by nearly as much. Ballard's fundamentals are clearly superior. Although Plug has some high-profile collaborations and is growing its revenue, Ballard's bottom line -- not to mention its balance sheet -- is superior, and so Ballard is the better buy of the two. Also, looking down the road, Ballard's next-generation fuel cell technology offers it the opportunity to win some converts from battery aficionados. But considering the state of the fuel cell market, being the "winner" here doesn't mean much. The industry still has a tough row to hoe as it struggles to break out of its niche markets into the mainstream. And it seems far more likely that the already widely accepted battery technology will continue to dominate, and possibly even cut into the few markets that still exist for fuel cells. So even though Ballard Power is the "winner," I wouldn't recommend buying either of these stocks unless you're a die-hard believer in fuel cells and have a very high tolerance for risk.